Bob Hindmarch has made a profound and fundamental difference in the lives of thousands of students, athletes, coaches and citizens through his leadership in sports and physical education at UBC, and through national and international sports organizations. Mr. Hindmarch is credited with helping start and establish the Man in Motion World Tour and was an advisor to Rick Hansen during his incredible journey around the world. Mr. Hindmarch coached UBC’s hockey team to an unparalleled string of victories, and established university sports exchanges, including the first Canada-China exchange. He established the UBC Sports Hall of Fame, was president of the B.C. Sports Federation, chairman of the Hockey Leadership Institute, director of the Canadian Amateur Hockey Association, chairman of the sports committee for EXPO 86, a trustee of the B.C. Sports Hall of Fame. He also helped bring the Grizzlies to Vancouver. In 1964 he was manager and assistant coach of Canada’s Olympic Hockey team – the start of four decades of commitment. He was Chef de Mission for the Canadian Olympic team in Sarajevo and vice-president of the Vancouver-Garibaldi bid for the 1976 Winter Olympics. He was an ambassador for the 2010 Olympic and Paralympic Winter Games bid. 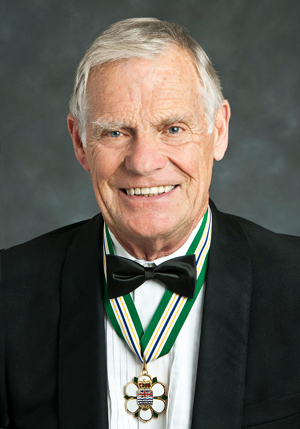 Mr. Hindmarch earned an honorary lifetime membership in the Canadian Olympic Association and was inducted into both the Canadian Olympic Hall of Fame and the B.C. Sports Hall of Fame.